WordPress 4.7 makes it easier to preview PDFs in the media library by generating image representations of the first page, which are now used throughout the media library and media attachment screens. Full size representation, rendered at 128dpi. The sizes generated can be modified, or the feature disabled entirely via the new fallback_intermediate_image_sizes filter, and are all stored in the sizes array in attachment meta. The preview images generated are used within the Media screen, Gallery, Attachment Details, and on the Attachment page for PDFs. 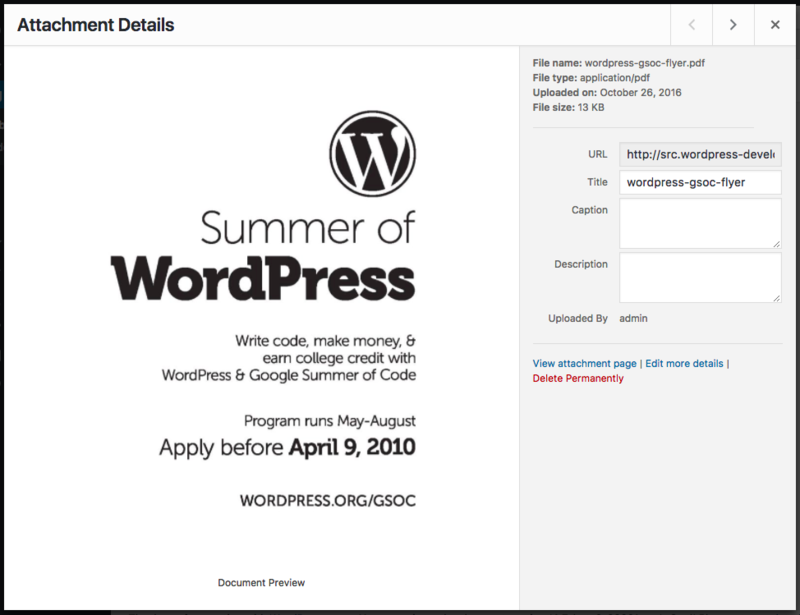 Core support is provided through WP_Image_Editor_Imagick and requires Imagick, ImageMagick, and Ghostscript support. 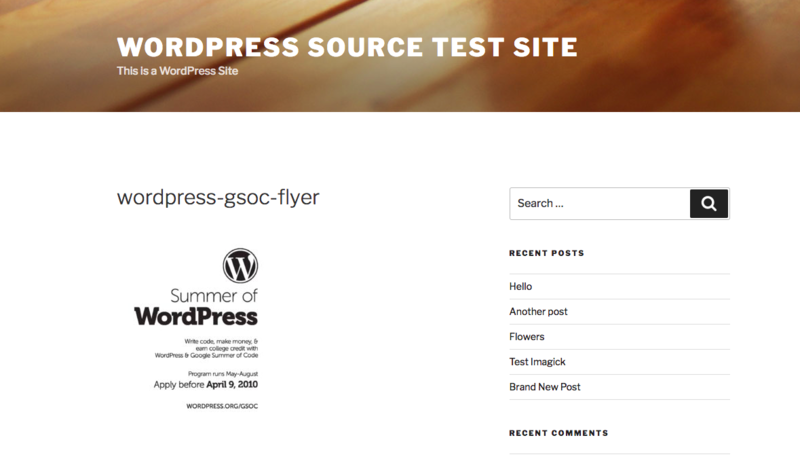 When not supported, or if the generation fails, WordPress falls back to previous behavior and saves the attachment without adding image previews to meta. For more context, see #31050 for the primary ticket and #38594 for the filter. Since this change requires having Imagick load only the first page of a PDF for performance reasons, this means that if you rely on core loading the entire PDF for your extension of WP_Image_Editor_Imagick, this will no longer function as expected (See: #38832). As a result, in , the PDF setup code was moved to WP_Image_Editor_Imagick->pdf_setup(), which can be overridden to restore the previous behavior if needed. This is exactly the small but deft improvements WordPress.org core should be making to what is mature software now. Thank you very much Mike! I waited this for the long time. thank you guys. Cool! Can the preview be used on a front end page too? Would love to have full (all pages) PDF preview and download capability.which can be inserted into posts. They sure can, Tom. To do so, you would retrieve them just like you would an image asset, passing the ID and image size you want to generate to wp_get_attachment_image(). That’s a great improvement! Two questions? 1) Is it possible to generate thumbs of existing PDF’s or is this for new uploads only? I don’t know if this has to do with this new PDF feature, but since upgrading to 4.7RC when I upload an image smaller than the smallest size set in the media settings, no thumbnail is shown in the media library/media uploader, the plain document icon is shown instead. I always get the medium sized preview on the attachment page. Expected? What is the purpose of selecting size before inserting to the post, when only a text link appears in the post? Yes, currently, that’s expected, but those would both be good improvements for the feature. I’ve been using the PDF Image Generator plugin (https://wordpress.org/plugins/pdf-image-generator/) to create thumbnail images of PDF files, mainly for use on the front end as featured images. Is that going to be redundant now? As of upgrading to 4.7, PDF Image Generator does not work for me. When editing posts, the Upload and/or Select to upload feature breaks. There are some conflict with PDF image generator and wp4.7 I’m preparing to update the plugin. But it might follow a significant system change of the plugin. Anyway i need to spend more several days for it. in my xampp pdf does not create thumbnail preview. do need this feture requirements? It requires Imagick, Imagemagick, and Ghostscript. @joemcgill added a feature to https://wordpress.org/plugins/debug-media/ to see the version of Ghostscript installed. If you list the versions of each here, we might be able to help debug. This does not seem to be working after updating WP on multiple sites…is there something I am missing? Existing PDF files in a media library. Anyone have an idea on how to create thumbnails of those besides downloading, deleting and uploading each and every one? Yeah. Here it is a small script that does exactly this. Seems to be a great feature . Need to try it. The new WP is great, especially because of the custom css feature. 1. It adds extra processing to every PDF upload. If a PDF is mostly/just text, the resulting thumbnail adds nothing except extra time to every upload. 2. I have at least one PDF that causes the gs binary that comes with CentOS7 to go into a 100% CPU loop that never finishes when trying to create the thumbnail. The upload never completes properly and it leaves the site in an unstable situation until the process is killed and the PHP-FPM instance is restarted. I don’t know which PDF will cause the issue until after I upload it, so it is a crapshoot to see what will happen. I love WordPress and new features are great. However, if they come at a cost and don’t substantively improve the media library in all cases, the option should be there to deactivate them. You can turn it off entirely with the `fallback_intermediate_image_sizes` filter if you want. I’d love to chat about the specific PDF(s) that cause the issue, and the versions of Imagick/ImageMagick/GS that you’re using so that we can see if it’s possible to improve the feature in core (or avoid it being enabled under certain configurations). Feel free to either create a new ticket in Trac (https://core.trac.wordpress.org/newticket), specific to this issue in CentOS, or contact me on WP Slack (@mike) to troubleshoot. Indeed a nice feature, but it seems existing images with the same name as the PDF are overwritten. I had an image named test.jpg. When I upload a PDF with the name test.pdf, the image will be overwritten with the ‘full size representation’-image of the PDF. Thanks for reporting this. Marking this for testing to see if I can reproduce it. Anyone else running this successfully on PHP7.1? I’ve got the latest ImageMagick installed (3.4.3 as of writing this) and my PDF thumbnails show up in the media library with black backgrounds where they should be transparent. Been banging my head against a wall trying to figure this one out.